by providing free transportation to and from chemotherapy treatments. Drops of Hope is a 501 (c) 3 non profit charity focused on building true long-term partnerships with our corporate sponsors. All contributions are tax-deductible and our administrative costs and overhead are always kept at a minimum. Cancer is a disease that has affected many of us personally – through a family member, friend, or even ourselves – but nothing is more heartbreaking than to see a child battling this disease. Each year about 12,000 children are newly diagnosed with cancer. The diagnosis of childhood cancer is a “family diagnosis.” With your support, Drops of Hope will work to raise money to provide critical assistance for children diagnosed with cancer and their families. Thank you in advance for your support of Drops of Hope. 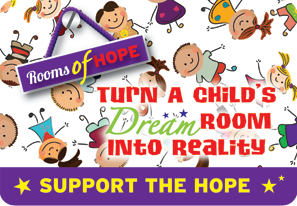 Rooms of Hope is dedicated to enhancing the healing process of chronically ill children by providing positive and imaginative bedroom environments. We give special attension to the medical, physical and emotional needs of each child by adding special touches that personalize the rooms and fulfill their dreams! Levylz.com donates from each sale funds that help support pediatric cancer patients and their families during their most challenging times. Their donations help make a difference and Drops of Hope Thanks You for your support. Copyright ï¿½ 2008-2012 Drops of Hope, Inc. All rights reserved.